This morning, Kayla and I hosted a bridal brunch for her friend, Jessica. Well, I was the caterer. 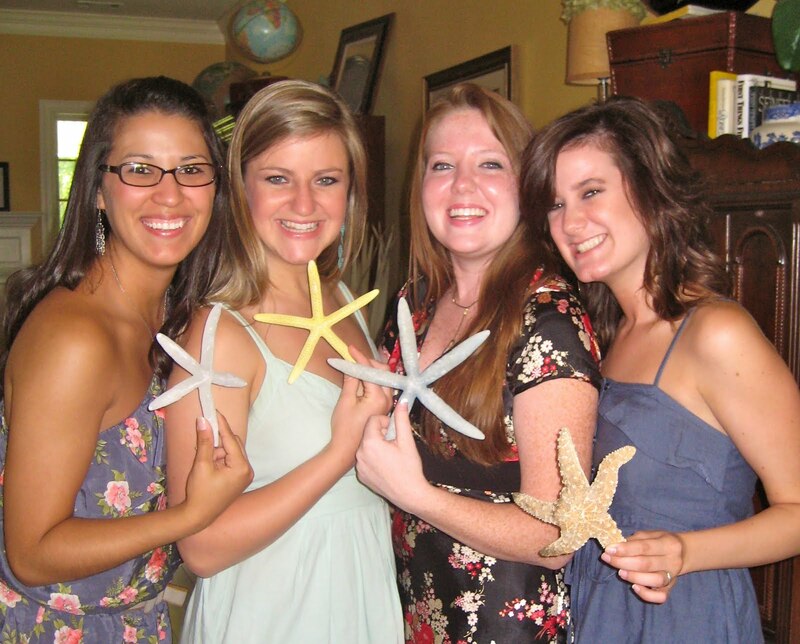 The theme was Starfish. 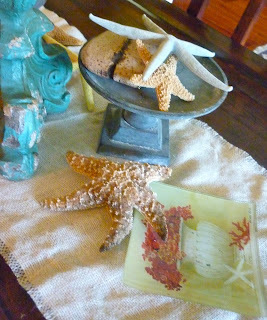 Yes, I did say starfish. I already have quite a few... seasonal decorating is big around my house. It is summer, after all. So, here's the backstory: With friendships formed in middle school, the girls were together frequently. During one of the many sleepovers, our bride jumped on her friends with her arms and legs splayed, shouting, "STARFISH!" as she propelled toward them. After the initial shock, they all fell into a laughing heap. The reference became their theme. Starfish gifts were exchanged often. 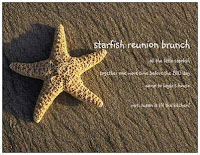 So... it was only natural to host a Starfish Reunion Brunch. I kept the menu simple and light. With a busy day ahead and rehearsal this afternoon, I wanted to give them enough energy to run on until tonight's dinner. Most of the food was made in advance, so we could enjoy our guests. It was sweet to watch the MOB & MOG, (mother of the bride, mother of the groom) get better acquainted. Sisters and friends recounted memories of events past and laughter was plentiful. As food and coffee dwindled, cameras were produced to document the day. Hugs and smiles and shouts of see everybody tonight! punctuated the departures... We really had a grand time. orange and pink grapefruit juices, coffee and espresso. How lovely. What a sweet story, delightful menu, and you my dear, well...YOU are a genius!